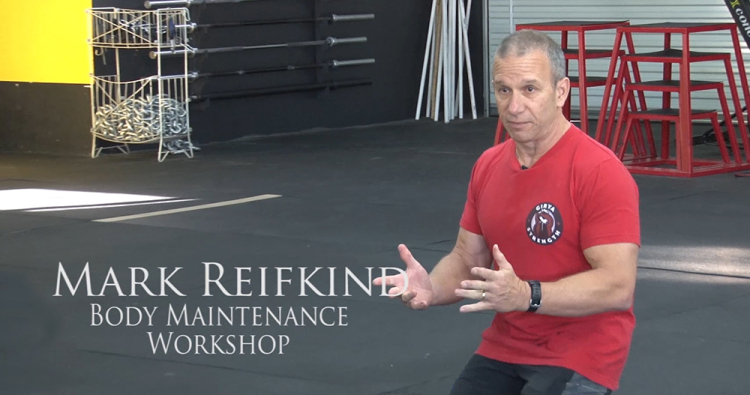 Mark Reifkind approaches foam rolling with a plan of action: to find the most painful spot within the most painful spot in order to teach a lesson on pain. Now we’re going to do a little drill. You’re going to get onto the foam roller, and you’re going to find a spot that’s painful. Let’s just say that. Okay? What I want you to do is I want you to find the most painful spot of that spot. Then when you find that I want you to find the most painful spot of that, and again, and again, and again. Let’s do that. Find the most painful spot of that most painful spot. One more time. All right. What happened? You can come up. Did it get worse or get better? Because there’s no center of it. That’s the trick. There’s no center of pain. The more you go into it, the more it dissipates. The more you withdraw (remember, motor intention to withdraw) the more you withdraw, the more it magnifies. So as all other times of philosophical implications we won’t get into. But, that’s the idea. No it does, really. But I’m saying just in this instance, if you look, if you go forward through it. It dissipates, it literally gets easier and releases. And if you’re going to do this type of work regularly that type of technique is going to come up very handy. Otherwise you’re just going to grunt and groan and fight it and you’re going to literally magnify the pain. Instead of breathing through it, and releasing the pain. If you want to hurt yourself just hit yourself with a stick. It’s faster. Okay? If you want to release the pain, you want to relax. Now when you’re training you’ve got to learn how to get tight. When your stretching and you’re mobilizing want to learn how to release. The way I designed this was very simple, so you’re going to get on the front plank, nothing, nothing, nothing okay. Side plank, nothing, oh here it is I’m going to work this bang. Okay. Tall sit. You’re literally going to be rolling around the foam roller. Okay, so tall sit. How many of you have done Turkish getups? This is the tall sit position, essentially. So go ahead get on the roller. So, first let’s do it from this height so get into your side, get in your IT band and then just sit on the roller. Start in your glutes, upper glutes, and where the hamstring is. You can actually sit and roll the glute all over the lacrosse balls a lot better. And again, rolling it back and forth use the technique that works for you, that works for you today. You might want a different technique tomorrow. But the whole idea is to run the length. Now take advantage of this downside arm. So if you’re slouching on it, you can support yourself and turn this into a really nice little workout in terms of low intensity toning and tension . . . a lot of my clients, they get a lot of tone and tension just from working on the foam roller. They’re pulling and pushing, and if you insist on their body position being correct, they’re getting a lot of good technique from this as well.